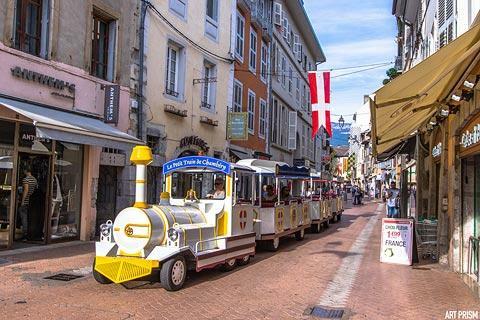 Chambery is an attractive and lively town in the Savoie department of the Rhone Alps, about 50 kilometres north of Grenoble. 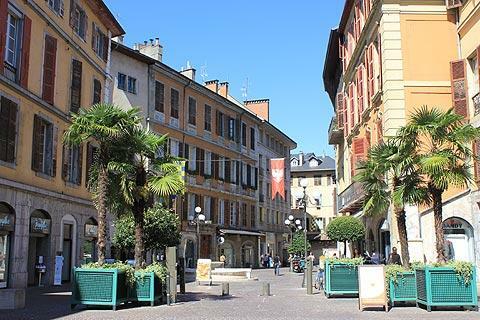 The city has a long history linked with that of nearby Italy, and the Dukes of Savoy and Chambery only became a permanent part of France in 1861 - see history of Chambery for details. 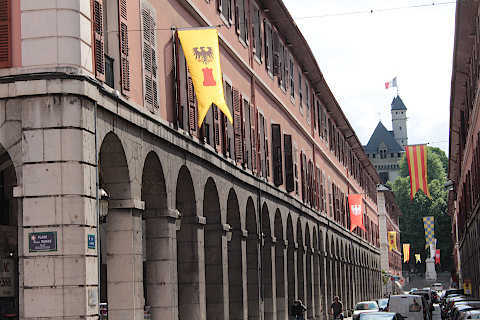 In recent years Chambery has had something of a revival and has been tidied up and important institutions such as the Musée des Beaux-Arts have re-opened. It is now bright and colourful and a really pleasant place to spent some time. 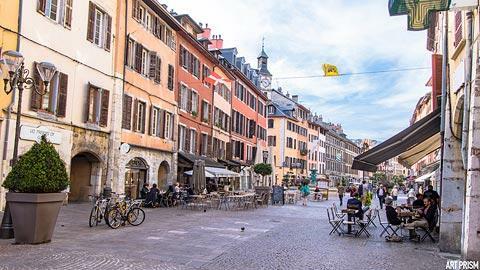 It also has one of the most inhabited town centres in France - add to that a student population of about 11 000 students and Chambery has a nice lively atmosphere for most of the year. 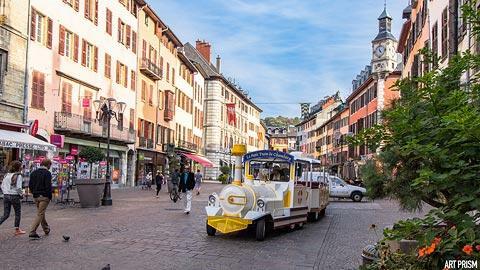 Start your visit in the wonderful Place Saint-Leger in the heart of the old town, featuring the Fontaine des Marmousets and a 19th century sun-dial and surrounded by tall houses all painted in different colours and lots of outdoor restaurants allowing you to sit down and really savour the atmosphere - and the food. 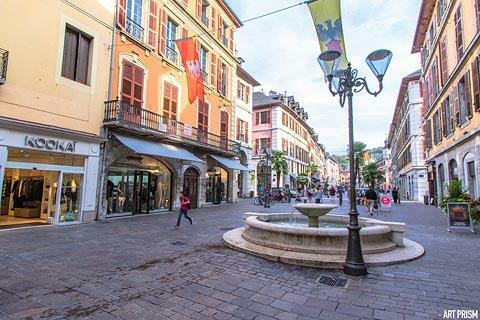 This square will likely be the highlight of your visit: your only challenge is to drag yourself away to explore the rest of the historic centre - there are also several notable historic monuments to discover while you are here! 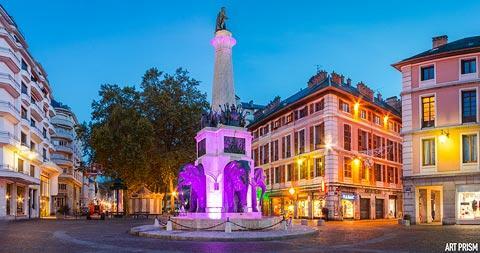 The significant amount of historic heritage in Chambery have led to its being officially listed as a Town of Art and History (Ville d'Art et Histoire') in France. 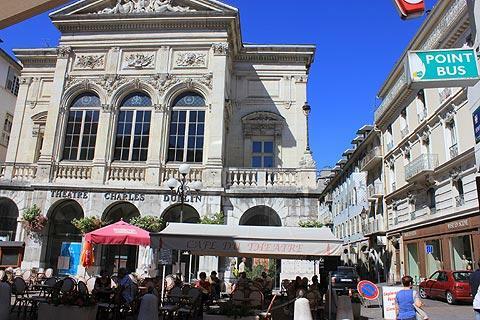 Learn more with a visit to the 'Interpretation Centre' in an imposing 16th century townhouse on Rue Saint Réal. 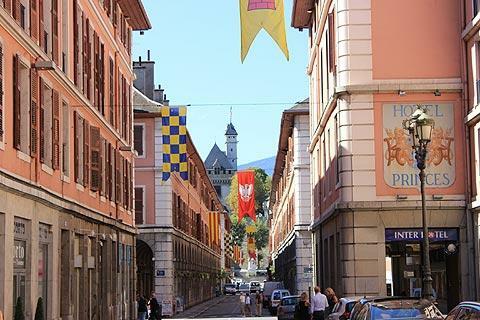 The historic centre of Chambery dates from the 15th and 16th centuries onwards. 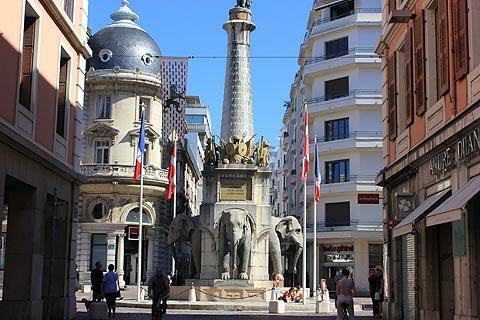 One curiosity you will see is the Fountain of the Elephants - built around 1838 in honor of Benoit Leborgne, Earl of Boigne (1751 -1830) on his return from India, after a wandering life in the service of an Indian prince. 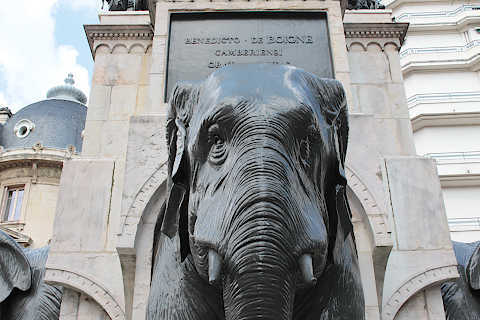 The fountain is arranged such that the four elephants make a sort of cross which represents the coat of arms of the House of Savoy. 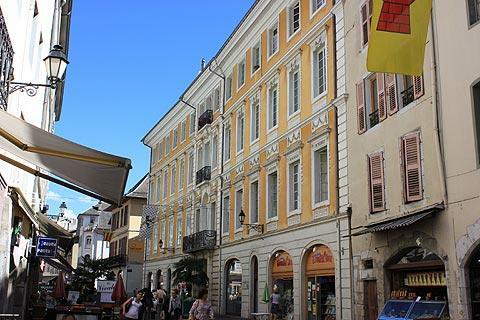 The city has a lot of other squares and streets of interest. 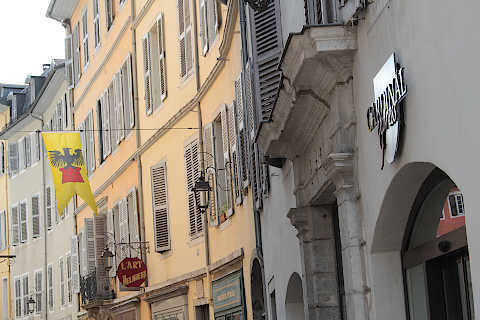 From the Place Saint Leger you can explore the many alleys that radiate in all directions, eventually reaching the elegant Rue Croix d'Or where you can admire some ancient aristocratic houses, some of which date back to the 16th century. One of these roads is also named after Boigne and contains many elegant shops. 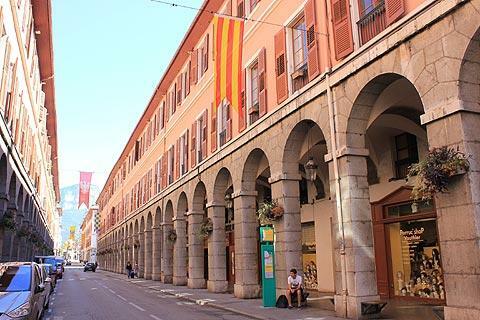 Throughout the narrow streets of the old town you will see numerous small architectural features of interest such as ornate doorways and wrought iron balconies. 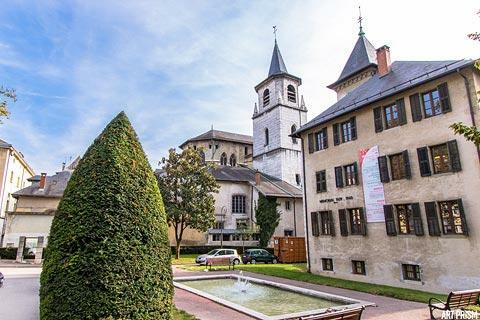 Chambery castle is an important building (the 'Castle of the Dukes of Savoy') and was sold by its owner (Berlion, Lord of Chambéry) to the Counts of Savoy in 1232. It remained the residence of the Savoy Counts until 1562. 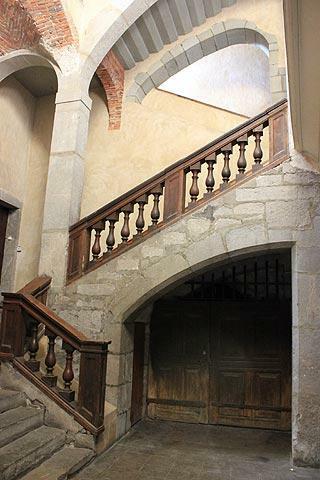 The castle is now home to the council offices but you can join a guided visit to see inside. 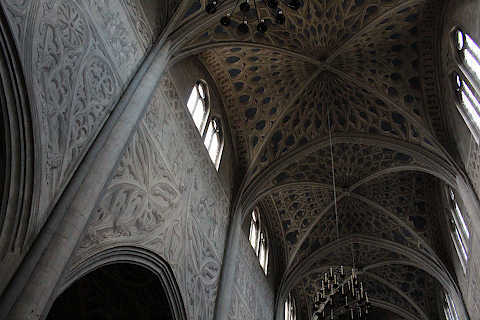 Its chapel, the Sainte Chapelle, used to house the 'Holy Shroud' brought to Europe at the time of the Crusades and entrusted to the Savoy Lords in 1452 (who moved it to Turin in 1578, where it gained the popular name 'the Turin Shroud' - there is a copy of the shroud in the cathedral). 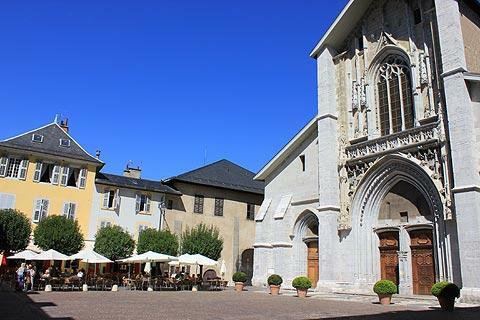 Visitors to Chambery castle can also see the 70 famous bells of the so-called 'Great Carillon'. 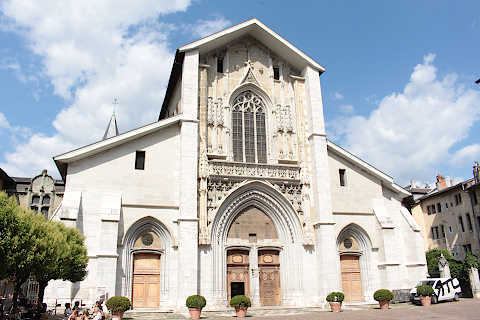 The gothic style 13th century Cathedral Church of the Franciscan Friars of "Saint Francois de Sales" has a rather austere facade but is home to the largest collection of trompe-l'oeil paintings in Europe. The highlight in the cathedral is the treasury which includes a 12th century Byzantine diptych among its interesting artefacts, and there is also a copy of the Turin shroud on display in the cathedral. You should also take a look at the baroque style Church of Notre Dame in Rue Saint Antoine, in particular for the internal decoration and furnishings. 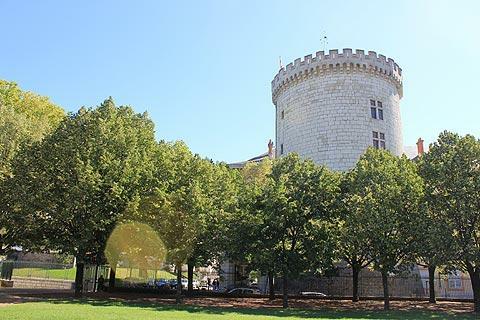 No visit to an important French town would be complete without a stroll through one of the city's parks, and there are several in Chambery. One of the most popular on a hot day is to walk in the shade beneath the trees in the Parc du Clos Savoiroux, while the Jardin du Verney is the oldest park in the town and also has plenty of space to sit down in the shade for a while. Enthusiasts of roses will want to visit the extensive rose garden in the Parc de Buisson Rond. This is a very large park based around a 19th century castle (not open to the public) a short distance east of the cathedral. The City Museum of Fine Arts (the "Musée de Beaux-Arts") contains some notable paintings including a beautiful painting representing the 'Adoration of the Magi' by Jean de Bruges and a copy of a remarkable 'San Gerolamo' by Correggio executed by local painter Gian Francesco Berengier in the 18th century. A large part of the museum is dedicated to paintings by Italian Renaissance artists, in particular 'Portrait of a Young Man' by Paolo Uccello and 'Trinity' by Bartolo di Fredi, and many others. French painters are represented by George de la Tour and Fragonard. 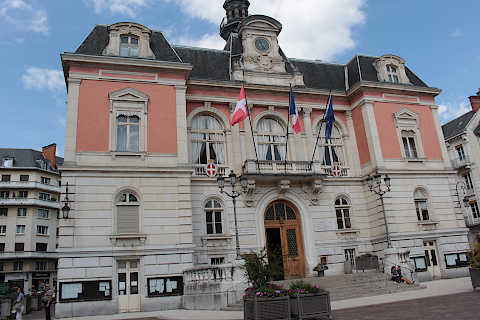 The Savoy Museum (Musee Savoisien) is also very interesting and contains numerous artefacts and pictures as well as numerous other collections, such as Roman coins, that explain the long history of Chambery and the Savoy region. At Les Charmettes a couple of miles south of Chambéry town centre (on the Chemin des Charmettes) is the house where Jean Jacques Rousseau (1712-1778) lived with the Baroness de Warens (1700-1762), a beautiful building and gardens dating from the 17th century. They also had a home on the Place Saint Leger. 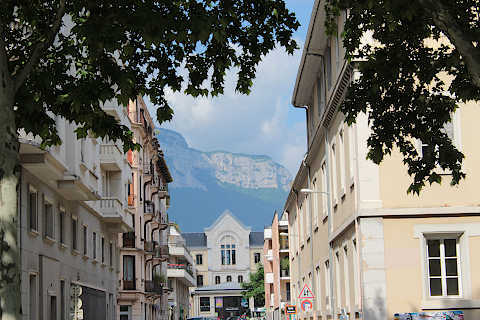 For naturalists, the surroundings of Chambéry include the Parc Naturel Regional de Chartreuse which includes Bauges, Chambéry, Grenoble and Voiron, and is known for its forests and the small villages it contains. 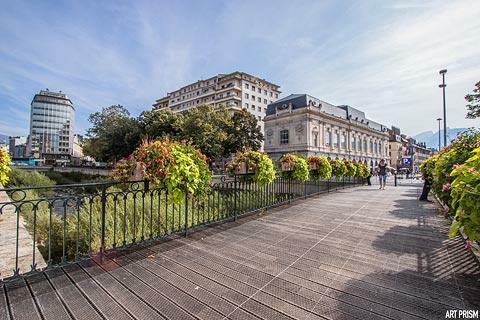 Bourget Lake, the largest natural lake in France, is just north of the town and you can visit the spa town of Aix-les-Bains on your way to the lake. 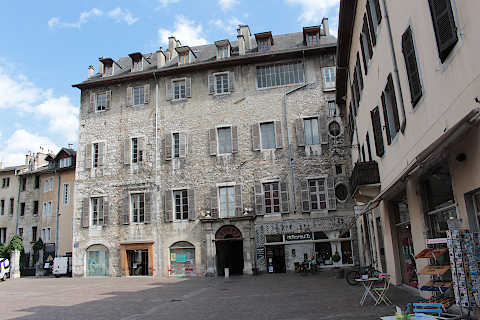 Another town with several interesting historic monuments that you might like to visit is at Belley, to the north-west of Chambery.